7 NOV 2017 MID-NIGHT (PACIFIC STANDARD TIME) ..
Washington State lies on the west (Pacific) coast of US ..It's geography is similar to that of Maharashtra with an area of 60% of Maharashtra state (India).. The west slopes of Olympus mountains receive the heaviest precipitation upto 6000 mms(rain+snow) in the continental United States, like the western ghats . The world record for highest snowfall in a season is in the Cascade range at Mt.Baker in the winter of 1998-99 .. 29,000 mms ( 1140 inches). SEATTLE REGION will get milder as this week progresses.. to 12 c / 6 c from current 8 c / 1 c ..Rain amount of 5-15 mms expected daily this week.. 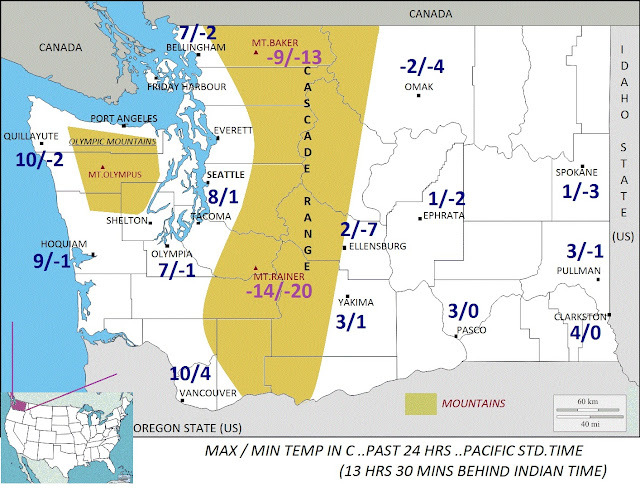 The popular SKI AREAS will be packed with fun for enthusiasts from next week, as moderate to heavy snow is expected over the Cascade mountains as this week progresses..
WASHINGTON state Map .. Past 24 hrs Weather .. Meanwhile , Mumbai city is warm and dry at 35 c (max) / 22 c (min).. Lowest min temp. in Mumbai region today was recorded at Karjat ( 17.9 c )..
Pune city is fine and dry at 31 c / 15 c .. Very well made.. Thank you... Dinesh. Was always under the impression that these resorts are only in rocky and applachian ranges..
Snowfall in Cascades and Sierra is a delight to track. People would think Alps, Alaska or Russia when you mention snow.. but most massive snowfall on earth happens in western USA with a huge number of stations (from Southern Sierra in california to North cascades) reporting annual snow amounts upwards of 600 inches every year! Snowfall in Rockies is usually much lower (200-500 inches typically). Thanks Raghu ..Good info from u as well ..Also, Cascades have active volcanoes.. While the El Niño Southern Oscillation (ENSO) remains neutral, the Bureau’s ENSO Outlook is currently at La Niña WATCH. This means there is approximately a 50% chance of La Niña forming in late 2017. Climate models suggest that if La Niña does occur, it is likely to be weak and short-lived, and effects on Australian climate less than during the last La Niña in 2010-12. Tropical Pacific sea surface temperatures (SSTs) have cooled since late winter. However, recent cooling has stalled slightly due to a pulse of tropical activity. 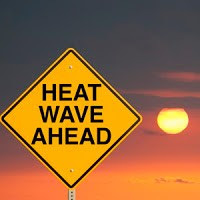 Cooling is expected to resume in the coming fortnight. Atmospheric indicators of ENSO, such as the Southern Oscillation Index (SOI) and cloudiness near the Date Line, have shown signs of shifting into a La Niña-like state. La Niña events typically bring above average rainfall to eastern Australia during late spring and summer. However, current temperature patterns in the Indian Ocean would typically push Australia's climate into a drier phase. Climate outlooks do not favour typical La Niña rainfall patterns across Australia for November to January. Weak La Niña events can increase the chance of prolonged heatwaves for southeast Australia.